Hello! It's time for a new Mojo Monday sketch (#177).. this week the sketch is super fun.. it's also contest week! When I first saw the tall, narrow panel on the sketch, it made me want to use one of the sweet animals from To the Moon. 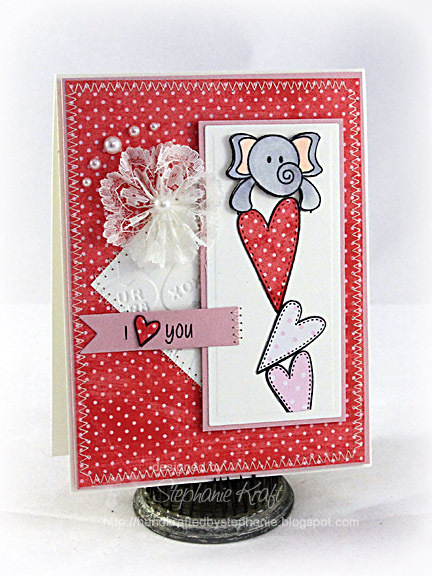 I chose Emery, the sweet elephant, who is trying his best to keep his balance on the stack of hearts. I stamped and colored him twice, cut one of his image out and popped it on top of the other. Then I randomly stamped a few of the hearts from Text Objects. The sentiment is from Love Notes. (Note: Two of these sets are currently on sale in the Verve store as part of the February Sweet Savings Sale!). For my embellies, I added a lacey flower rosette and some ivory pearls from Pizzazz Aplenty. Accessories: Long Rectangle Nestabilities (Spellbinders), Double-Ended Banner die (Papertrey Ink), Embossing folder (Provo Craft), Markers (Copic), Lacey flower rosette, Pearls (Pizzazz Aplenty); Foam tape, Thread, Sewing machine. This is ADORABLE, Steph! LOVE the lace flower!!! CUTE CUTE CUTE! That elephant is just soooo cute!! I love the hearts he's balancing on! Great card. What can I say? This one just got me with it's adorable cuteness!! Such a fun card yet sweet too. How perfect is this?? You nailed this sketch with that tower of hearts with Emery - sooo cute! Adorable image! Lovely take on the sketch.